McDonald's Corp. (NYSE: MCD) is scheduled to release its fourth quarter earnings for 2009 before the market open on Friday, January 22, 2010. Analysts, on average, expect the company to report earnings of $1.02 per share on revenue of $5.93 billion. In the year ago period, the company reported earnings of 87 cents per share on revenue of $5.57 billion. 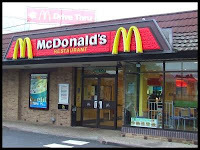 McDonald's Corporation, together with its subsidiaries, franchises and operates McDonald's restaurants in the food service industry worldwide. Its restaurants offer various food items, soft drinks, and coffee and other beverages. The company runs more than 32,000 restaurants in more than 100 countries. The fast-food restaurant chain benefited from recession amid continued emphasis on its core menu, branded affordability, breakfast and convenience. In October, the Oak Brook, Illinois-based company reported that its third-quarter net income advanced 6% to $1.26 billion from $1.19 billion in the prior-year quarter. On a per share basis, earnings totaled $1.15, up 10% from the previous year's $1.05. Quarterly revenue dropped 4% to $6.05 billion from $6.27 billion reported a year ago. Analysts, on average, expected the company to report earnings of $1.11 per share on revenue of $6.10 billion. It appears that McDonald’s growth is finally cooling. Though the company has been reporting rise in same-store sales over the past months and has been faring better than its competitors, the persistent weakness in US market is now hurting the business of one of the world’s most recognizable brands. Last month, the McDonald's reported said sales at restaurants open at least a year fell 0.6 percent in the U.S in November as elevated unemployment levels curtailed sales. It was the second consecutive monthly decline for the measure, an important indicator of a restaurant chain's health, and a steeper fall than October's 0.1 percent. The company is also feeling the heat of heightened competition from other fast food chains such as Burger King (NYSE: BK), Taco Bell (NYSE: YUM) and others who have increasingly been pushing value menus and discounts of their own. Meanwhile, as competitors take aim at McDonald’s value options, McDonald’s continues to promote their McCafe coffee drinks as a cheap alternative to competitors like Starbucks (NASDAQ: SBUX). For the fourth quarter, McDonald's expects recording approximately $85 million of after tax income, a roughly $0.08 per share benefit, primarily due to the resolution of certain liabilities retained in connection with the 2007 Latin America developmental license transaction. The company's stock currently trades at a forward P/E (fye 31-Dec-10) of 14.12 and PEG ratio (5 yr expected) of 1.66. In terms of stock performance, McDonald's shares have gained nearly 8% since over the past year.